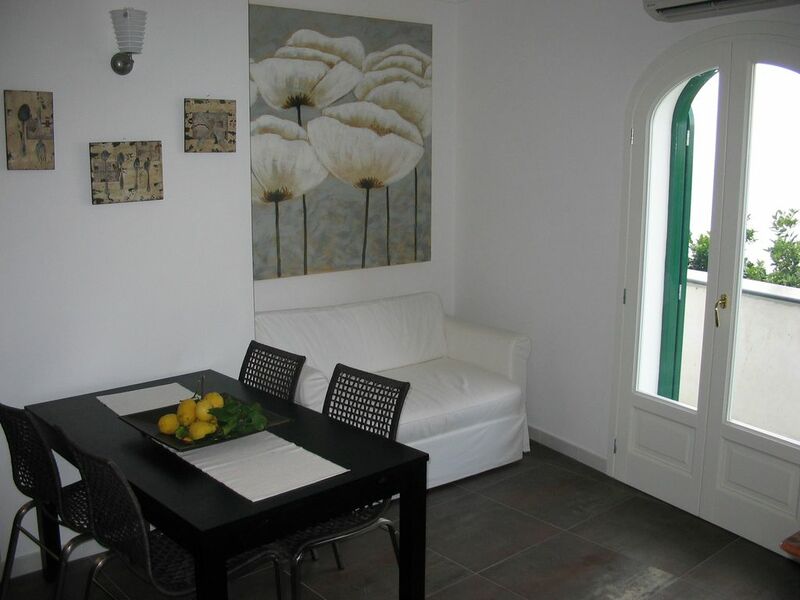 The apartment is located in an ancient villa typical of the Amalfi Coast with views of lemon and orange gardens. The apartment has a porch and a small balcony that open onto the Gulf of Positano and, passing through the Sorrento Peninsula to Punta della Campanella, join the island of Capri with its incomparable "Faraglioni". The apartment can accommodate up to 4 people and consists of an entrance hall, living room with kitchenette and sofa, two bedrooms, bathroom with shower with hydromassage. The apartment is equipped with heating, air conditioning, TV, dishwasher and washing machine. The property is well situated in Praiano, convenient for bars, shops, restaurants and beach. We visited Praiano in July 2018. After a 90 minute taxi ride from Naples airport we were met outside the property by Gaia (Luigi’s daughter) who was lovely and spoke perfect English. The apartment was ideal for our family of four. It was clean and tidy and reasonably well equipped. The view from the balcony is absolutely stunning. It’s a bit of a trek to the beach but for a couple of quid, the beaches in nearby Positano and Amalfi are easily reached by bus. Praiano has plenty of bars and restaurants but be prepared to pay more than you would in the UK - Oftentimes our bill for 4 main courses and 4 drinks was the best part of 100 Euros. That said, the Amalfi Coast is well worth a visit. Would recommend visiting Amalfi, Positano, taking a boat to Capri and of course visiting Pompeii. If you’re feeling fit try ‘the walk of the gods’ - it starts right outside the apartment. We hope to have you once more in our house. Thank you Mr Maendl for your nice words about our apartment. Stayed here for 5 nights in June 2016. We are a family of four, two adults and two teenagers. The apartment was perfect for us. We were very happy with our decision to stay in Praiano instead of Positano or Amalfi. It is easy to get to other the other towns, but we appreciated the quiet and calm of Praiano at the end of the day. You can easily walk to several restaurants from the apartment. We especially enjoyed La Strada and Che Bonta (dine in or take away). There is a grocery store close by where we shopped every day. The tourist information center is close as well. We found everyone in the town to be welcoming and friendly. The view from the apartment is amazing! The apartment itself is spacious and clean. We used the washing machine twice and there is a drying rack that we set out on the private patio for our clothes to dry. Luigi was very easy to work with. Although we never met him, he was always quick to respond to my emails and texts. I definitely recommend House of Lemons as I know we'll return again. Our family of 4 stayed here for 6 nights, and absolutely loved it. The apartment is clean, comfortable, spacious, and very accessible. It has a beautiful view of the coast and Positano. It is right off the main Amalfi coast highway so you don't have to climb up or down, and walking distance to shops, restaurants, beach, and right at the bus stop to everywhere. Unlike most properties in Amalfi coast, it has an elevator to the apartment so you don't have to drag you baggage up so many uneven steps. It's a prefect place if you want to visit other towns but avoid the touristy crowds and traffic in Positano. This is the next town over from Positano. The owner, Luigi and his family, are very helpful, courteous, and friendly. They make sure you are comfortable and help you with planning your visit. If you are driving with your own car, let them know ahead of time so that they can arrange a parking space. Consider taking public transport to here since driving to/from here is a big challenge and time consuming during high season. Thank you for notes, we really appreciated it! I hope to have you once more in Praiano! Thank you so much. Wir verbrachten die erste Septemberwoche in Praiano. Die Ferienwohnung war dank der guten Beschreibung durch den Vermieter leicht zu finden, die Begrüßung sehr freundlich. Wir sind froh gewesen, den Vermieter vorab nach einem Parkplatz zu fragen, den er für uns dann organisiert hatte. Parkmöglichkeiten sind an der Amalfiküste sehr rar. Unseren Mietwagen durften wir auf dem Grundstück einer netten Signora abstellen, unweit vom "House of Lemons" entfernt. Die Wohnung machte einen sehr hochwertigen Eindruck und war mit allen Annehmlichkeiten ausgestattet. Es fehlte uns an nichts :-). In natura war sie sogar noch schöner, als die Bilder hier vermuten ließen. Den grandiosen Ausblick von der Terrasse auf Meer und Positano muß man selber gesehen haben, dass können Fotos gar nicht so zum Ausdruck bringen. Der Kontakt zu Luigi ist sehr freundlich gewesen, ab und an standen kleine Aufmerksamkeiten wie Tomaten samt Basilikum aus dem eigenen Garten und Feigen vor der Wohnungstür. Wir hatten den "Luxus", mit einem kleinen Aufzug die Ferienwohnung zu erreichen. Zu Fuß sind es ca. 50 Treppenstufen gewesen. Wir haben eine tolle Urlaubswoche in Praiano genossen und können das House of Lemons gern weiterempfehlen. Im Ristorante "La Brace" direkt im Haus haben wir sowohl köstlich gespeist, als auch leckere Pizza mit nach oben genommen. Vielen Dank für die freundlichen Worte, auf dem House of Lemons. Es wird uns eine Freude, Sie wieder in unserem Haus zu haben; Sie tolle Gäste gewesen. Praiano is a village 10 km from Amalfi and 5 km from Positano, with a Mediterranean vegetation with lemon trees, orange and olive trees. Quiet village that climbs to the famous 'praianesi stairs', full of hanging gardens and villas, but also the artistic elements of a story made of shrines, chapels and picturesque passages ranging up to Punta Bells and the 'mythical' Faraglioni Capri. The churches of San Luca and the church of San Gennaro with their colored roofing tiles stand out against the blue sky praianese. Give them an unforgettable charming courtyards and boundless. The beaches of Cala Gavitella and Marina di Praia are famous for their clear waters but also for their local night spots of.